Johnson Controls Inc of Milwaukee and China's Wanxiang Group Corp are battling over who will buy A123, a maker of lithium ion batteries for electric cars. The prospect of a U.S. government-financed company being sold to a Chinese rival has drawn opposition from some politicians, who say technology underwritten by U.S. taxpayers should not fall into foreign hands. The government objected on Tuesday to the terms of the company's proposed sale order, saying in a court filing that its approval was needed before the government's clean energy grant could be assigned to a buyer. A123 can still draw $120 million under various government grants, according to court records. In the filing by Stuart Delery, a principal deputy assistant attorney general, the government did not indicate whether it supports or opposes any specific buyer for the company. 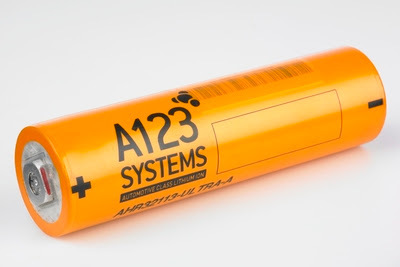 Other parties that have expressed an interest in A123 include NEC Corp of Japan and Siemens AG of Germany. The money from the auction will go toward paying off A123's creditors. "This transaction would no doubt result in the loss of American jobs and the transfer of technologies critical to our nation's infrastructure and military hardware to China," said the letter from the Strategic Materials Advisory Council. Among those who signed the letter were Barry Costello, a retired vice admiral, and two retired major generals from the U.S. Air Force, Robert Latiff and Jeffrey Reimer. Several Michigan lawmakers from both parties, including Democratic senators Debbie Stabenow and Carl Levin, also asked the committee to turn Wanxiang down, citing concerns about the company's opaque structure and possible ties to the Chinese government. "In light of existing A123 contracts with the U.S. Department of Defense, we are concerned that the acquisition of A123 by Wanxiang might constitute a potential threat to U.S. national security," the letter said. Two Republican U.S. senators, John Thune of South Dakota and Chuck Grassley of Iowa, warned earlier this month that Wanxiang could gain access to A123's military contracts if it were allowed to buy the company.